Today, we talk about a legend from the American Civil War period. Gardner was one of the early photographers who made people question photographic “truth”, as the photographs he took of the civil war appear to be staged– because, well, they kinda had to be. Gardner’s process was wet-plate, which was kind of hard to execute (ouch, that pun,) on an active battle field. U feel me? Home of a Rebel Sharpshooter was one of many photographs featured in Gardner’s Photographic Sketchbook of the Civil War, which was presented in two volumes. It is believed that Gardner and his assistants moved the body to this position and propped up the weapon, as a sign of his profession. Talk about morbid. Speaking of morbid: you could get this guy as a stereo image back in the day, y’know, for a realistic 3D viewing of a dead guy while sitting in your parlor room. Even more morbid: I went to Gettysburg on a middle school trip, and one of my friends laid on the ground, just like the subject of Gardner’s image. Without knowing anything about it, I also posed like I was dead. I’ll have to find the photo of this, uh, charming occurrence, because it is a classic example of why I may scare small children from time to time. Gardner is closely associated with the photographer Mathew Brady, who actually inspired Gardner to become a photographer. After listening to Brady’s idea to photograph the war (Brady was blind at this point in his life,) Gardner used some connections to become the chief photographer under the jurisdiction of the U.S. Topographical Engineers. He was given the honorary title of captain and he shot (I laughed at this terrible pun,) many important battles of the Civil War, including the Battle of Antietam, Battle of Fredericksburg, Battle of Gettysburg, and the Siege of Petersburg. A lot of ‘burgs. Shout out to field photographers who work in dangerous times. That’s all for my crash course on Alexander Gardner. The next PotD will be a photographer who I just recently learned about, Robert Heinecken. And no, he has nothing to do with the beer. The combination of the arts and sciences is something that seems relatively new, but, spoiler alert: it’s not. Also, next time someone tells you that we don’t need the arts, I want you to calmly point out Edgerton, and then lock them in an art gallery for a week. Edgerton was one of those people who made you feel really, really insignificant, because he was so awesome. You know what I’m talking about. Dude was a professor of electrical engineering at MIT. And he did photography– like, c’mon man, what are you? I mean, he grew up in Nebraska, so he must have been bored, so maybe that’s why he’s good at everything. The apple is my self esteem and the bullet is Eddie’s work. Something deep? These photos are oftentimes a dialogue about violence against the person. So, let’s drop some science and some tortured artist business in one go. And just when you thought this man couldn’t get any cooler– he also won an Oscar for his short film, Quicker’n a Wink. Because he could. The nice thing about Eddie is that he was a kind individual who loved teaching. “The trick to education,” he said, “is to teach people in such a way that they don’t realize they’re learning until it’s too late.” Can I have him as a professor? Because he sounds awesome. That’s about it for Henry E. Edgerton, Papa Flash, the man who made time stand still (which is what he was dubbed by National Geographic– I’m telling you, this guy was unreal.) The next PotD will be Bernard Faucon. 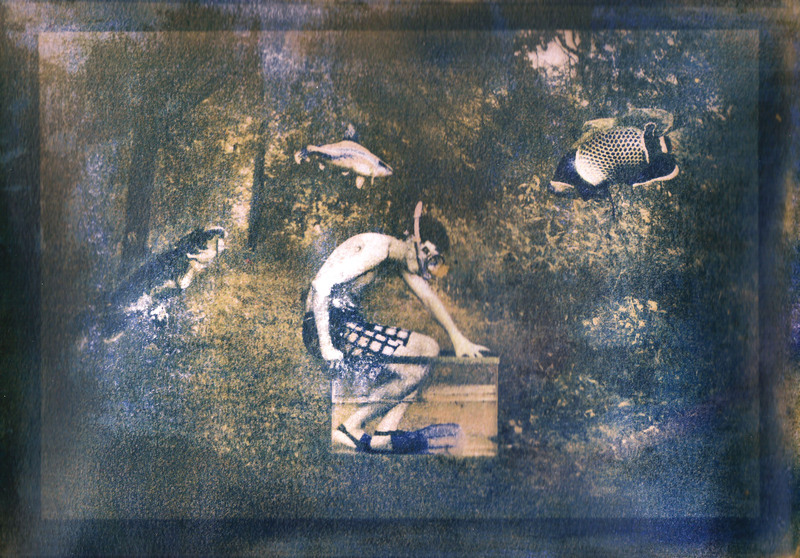 My misadventures in gum printing continue. This time I was a bit frustrated with the results I was getting and I had a stack of prints I hated and wanted to burn. Instead of burning them though, I did some experiments with bleach. I got a lot of different results, but I’m pretty pleased with how it went and I’m already making plans to use bleach to add to the content of my next images. Let’s start with this one. I worked in my bathtub like all the well-equipped photographers do, and I filled it with water about 1/4″. I then put about 1/3 cup of bleach into the water, submerged the picture, and waited two minutes to rinse it off. Oh yeah, you wanna rinse these off or the bleach will keep on bleachin’. Before, the image was dark and murky. I wish I had a before photo to show you, but you’ll just have to take my word for it. The bleach lightened it up and brought out the background. Yay! This one was fun– not. I was trying to make a vignette with the bleach, but, uh, see the top left? I got carried away. So I just said whatever and immersed this one in the bathtub that had like a capful of bleach for twenty minutes, and then I took a brush and was just making marks on it. Talk about strange. Yeah. I splattered bleach on this one and got carried away. Whoops. I got super excited over this one. I made drops on the print this time, and they remind me of fairy lights. I also bleached my subjects, trying to bring them out of the background, but this was before I realized I needed to rinse the prints to get the bleaching to stop, so I brought them out so much they turned into ghosts. But I’m thrilled with that, because, I mean, look at the picture. It’s already creepy. Ohhh this one. When I put it in the tub, I put the image face down. 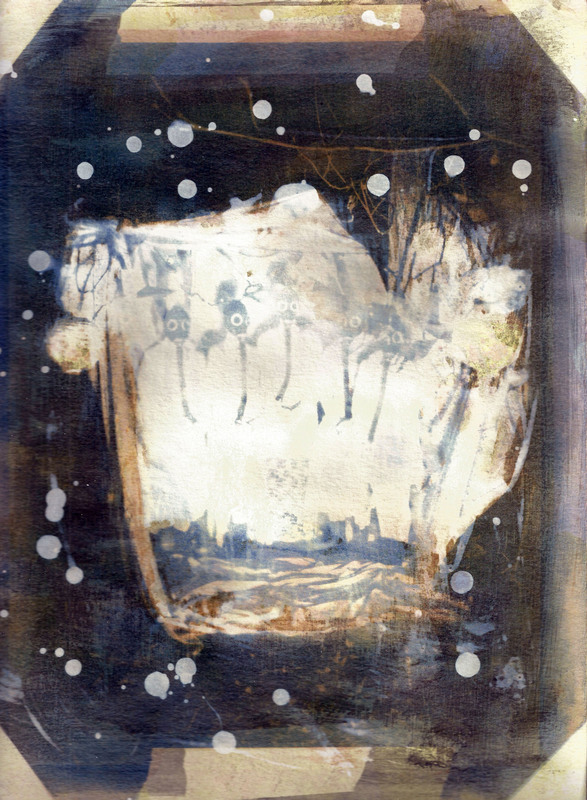 I was thinking about the gum bichromate process, where you put your image face down in the tray for development. I left my print alone for 20 minutes (I did this one the same time I did the failed-vignette,) and when I came back my bathtub somehow drained and the print was just chillin’ on the bottom of my tub. My bathtub has some swirly groove things, which apparently held onto the bleach, thus creating this cool image. I played with the darkness and the colors of the prints a little bit in Photoshop, to make them look more dreamy/trippy. I think I succeeded. That’s my latest update with these. I’m going to try a new negative process to try and get the colors I want, so wish me luck. I’m doing this for another year. December felt very long and very short all at the same time. Shoot, 2014 felt very long and very short all at the same time. So these are my December adventures. And yes, those are Pizza Rolls and pierogies, and that was my New Year’s feast, while watching the Ball drop in Time Square from my warm living room. When learning about contemporary photography, Rineke Dijkstra is one of the first photographers mentioned, at least in my experience. As the Photographer of the Day, I’m going to try and tell you just why that is. First of all, Dijkstra is the bees knees. She lives and works in Amsterdam, and started her career as a commercial photographer. She began her foray into the portraiture she is known for when she had an assignment to photographs that pointed to summertime. Beach balls, piña coladas, bonfires– but actually no. She photographed adolescent bathers. It might sound weird now, but she had permission and it was the early 90s. Twenty years ago people were a lot less paranoid than they are now, and because of that Dijkstra made a body of work called Beach Portraits, which, when displayed, were printed life size. Talk about impact. Can you imagine going up to people on the beach and being like, “yo, I’m a photographer and I wanna photograph you in your swimsuit.” I’m sure these bathers didn’t come to the beach anticipating a photo shoot. I mean, look at their body language– obviously unprepared. Understandably. The thing about this body of work that I can’t help but notice is the technicalities of it, which are actually pretty simple. Dijkstra’s subjects look separated from the background because of a head-on flash. Folks, this is a prime example to how flash can actually help your work. I think this technique makes the backgrounds look like backdrops. Pretty neat-o. 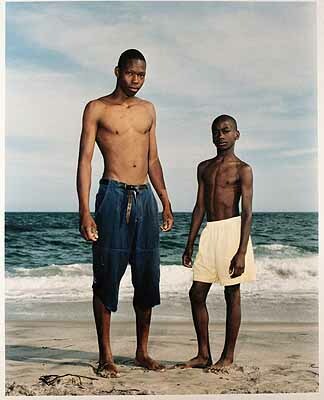 Beach Portraits is just one example of Dijkstra’s works, which are almost always portraits and are almost always portraying people in a vulnerable way. She had a commission from the Anne Frank Foundation, where she took photos of adolescent school girls to make the point that any girl could be like Anne Frank in adverse circumstances. Her work is not just for show, as the connection between people– their awkwardness, their vulnerabilities, their humanity. Also, anyone notice how the girl in the orange bathing suit is kind of like Botticelli’s Birth of Venus? Well, you’re not the only one. The next PotD will be Harold E. Edgerton, so keep an eye out for that and for some new work coming from yours truly. So no, I have not exchanged photography for rants about photographers. Sorry to disappoint. One of my favorite ladies ever is Julia Margaret Cameron. What’s also cool about her is her great-niece is Virginia Woolf, who is one of my favorite authors. So, why is she remembered in the history or photography? She took it up later in life, when she was 48 years old, when her daughter gifted her a camera. Her work was mostly portraits of family and even famous figures, like Charles Darwin and her neighbor, Alfred Lord Tennyson (who brought people to Cameron’s house to view her work– what a pal!) She was most definitely the best “amateur” of her time, but man, I wouldn’t label someone with her success as such. She made sure to copyright all of her photos– hardly amateur, my dear Watson. Cameron’s signature was soft focusing, which was pretty helpful considering one of her many goals was to capture beauty. Nothing says pretty like soft focus portraiture of pretty ladies. Another thing she is known for is using her maid (Mary Hillier) frequently as a subject in her illustrative work. Cameron was really into creating scenes from history or literature, like her piece Ophelia, Study no 2. Because of their softness, they’ve been oftentimes compared to oil paintings. 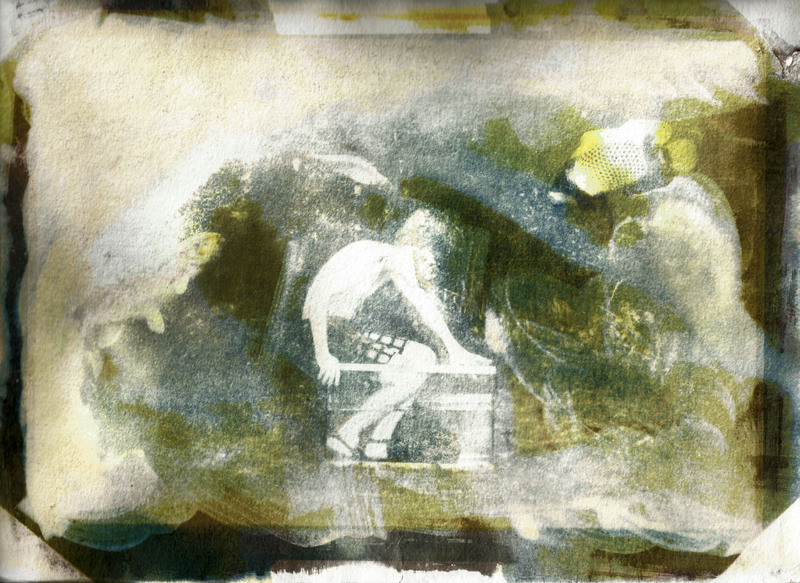 So, the painterly-ness of her images and how she constructed images based on narrative, they are dubbed illustrations. She really enjoyed the concept of a woman’s choice between life or love. Morbid much? That’s Victorian for you. Julia Margaret Cameron is a staple in photographic history, and it is special to note that she is a woman– it’s rare for women in the past to be credited in the world of art, and Cameron is one of the first “famous” female photographers, like Jane Martha St. John and Constance Fox Talbot, and even they aren’t mentioned as much as Cameron. So my lady here must have been super duper epic– well, it’s obvious she was. Cameron is my gurl, and I only wish I could use soft focusing as well as she did. Don’t forget this lady, because she is truly a treasure. So enough of my gushing over Cameron. Next PotD will be Rineke Dijkstra, another one of my favorite ladies.